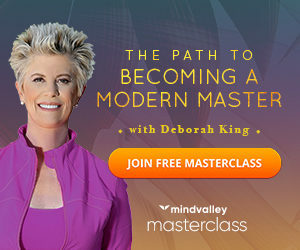 I have just finished taking a 42 day meditation challenge, and I did it with the guidance of Deborah King and her online course ‘Be A Modern Master’. So what happened during this challenge and what did I get out of it?This post will go into detail my experience during the course, the cost of the course, the way it is delivered and what it contains including a day by day summary of my experience and an over all conclusion. Who is Deborah King and why should you listen to her? “Deborah King is an educator, attorney, leading authority on energy medicine, and New York Times bestselling author. Through her media appearances, standing-room only speaking engagements, workshops, and books, she has shown many how to heal physically, emotionally, and spiritually. The other thing I want to say is that Mindvalley Academy always bring on the most cutting edge educators. So, you can be assured that if Mindvalley is hosting an authors course, you are getting great information from someone who is at the top of their field. Watch the video below, or scroll down to keep reading. What is Be A Modern Master about? So, in this course you first learn mantra meditation and each week are given more and more sutras to add to your meditation practice until you have 20 in total, and you learn them by memory. Your meditation session starts out at around 15 minutes at the beginning of the course, but by the end of the course when you have learned all 20 sutras I found the meditation went for usually 20-25 minutes. 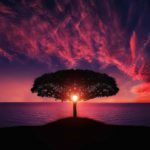 Apart from the scientifically validated fact that meditation can profoundly reduce anxiety, stress and depression and enhance immune health and over all happiness, mantra meditation can also bring deep spiritual insights and enhance your intuition and connect you to what would be considered supernatural powers such as your innate psychic abilities. If you are interested in anything along the lines of clairaudience, clairsentience, clairvoyance etc then this course would suit you very well. But if not, mantra meditation can also connect you more to what would be considered more clarity around your life purpose, who you really are and what you have to give to the world in your own unique way. So, it all depends on what your intentions are and what gifts you would like to develop. What was I hoping to get out of the course? I want to feel like I am more connected to my intuition and be guided by my heart and instincts in my every day life. I feel I get into my head too much and often my decision-making is therefore clouded. I also wanted to attempt to heal long-standing injuries within my lower back and tight right hip. While I often manage these areas fine with good exercises practices and they don’t give me too much of a problem, they are still reoccurring and obviously have become an energetic pattern in my body. I would like to clear these. I have tinnitus, and it has been said that ringing in the ears can be a sign that you are not listening to your spiritual intuitive self. I would like it noted I have consulted doctors and a specialist about this of which they had not much to say about it. So, I wonder if I take a deeper spiritual development path if it might help. Also, given that I teach yoga, I would like to be able to offer more to my students just as far as my own grounded energy goes. I am aware that when you teach a class (of anything) you are entraining your students with your own vibratory pattern. They take it on. So, I feel if I am coming from a more peaceful grounded place than I am at the moment, they will get more benefit from my classes. More psychic abilities. I want to be able to trust the psychic intuitive hits that I get about people and situations more. This once again refers back to just living more from the heart and less from the head. Did I achieve these things by the end of the course? Read on to find out and be sure to check out my day by day break down at the end of this post to learn more about my experience with it. $695US, or 3 installments of $279. However, I highly recommend you attend the free masterclass online first because if you purchase straight after the class you get quite a substantial discount (I paid $349US for my course after I attended the masterclass). Purchase the course here. The delivery of the course is online through the learning platform that Mindvalley has created. When you enroll you will get your own login and password to their online platform, and you can also download their app. You can listen (or watch) via their app while walking the dog or doing cleaning or driving your car, or sit and watch on their desktop platform. It really is designed to be able to fit into your life so you won’t feel as if you have to give up a lot of time in order to absorb the teachings. 6 weeks, but you can move through the course at any pace you like. However, it is not recommended you move through it faster than 6 weeks, even though you could if you like. 15-20 minutes of meditation, ideally twice a day, but once a day is OK too. I stuck to once per day. About 2 hours of listening/watching (although there is actually no need to watch unless you prefer to see Deborah as she speaks. You can just listen if you prefer). This time is on top of your 15-20 minutes a day of the actual practice that is being taught. I would most recommend this course to people who have some experience with meditation just in terms of feeling comfortable enough to be able to sit for at least 15 minutes at a time. But, experience is not absolutely mandatory, but just know that you will be expected to sit for at least 15 minutes a day. I’d also recommend it to people who are looking to embrace a new perspective of life because their current perspective is no longer working for them. If you are open to the idea of energy work and exploring different levels of consciousness, this will suit you perfectly. If you are searching for a spiritual practice and curious about developing your innate gifts which are lying dormant in you, this is also for you. When you enroll in this course you also get access to Deborah’s ‘Lifeforce Energy Healing Meditation’ program, and this really only takes you an hour and a bit to get through and is really important as it is a foundation for the Sutra practice she teaches over 6 weeks in Be a Modern Master. You can also become part of her private Facebook group which allows you to interact with others who are also doing the course. Keep a meditation journal and document each day. Benefits can sometimes be subtle and you may forget about them once you have experience them, so keeping a journal can keep you aware of what is actually shifting and changing for you. Best time to meditate is early in the morning, and if you have kids-REALLY early in the morning, before they get out of bed. Once the day gets going you will be less inclined to do it, and your head will be more busy. Be sure to listen to the coaching calls that were recorded-these will address many of your questions as they did mine. Use the Mindvalley app on your smart phone so you can listen to some teachings while driving/commuting or doing domestic work around the house. There will be times where you will have to sit down and do an exercise, but most of the time not. Be sure to revise the PDF’s provided of the summary of what was taught in each week. These are very handy and are time stamped where certain things occur in the recordings. Make sure you join the private Facebook group and interact with other students. When I think back to all that I have learned over the years such as studying things like The Law Of Attraction, qigong, energy medicine, music, yoga, sacred geometry and the reoccurring mathematical formulas and numbers in the universe which all relate to sound in some way, it has hit me recently that the only conclusion I can come to is the act of creating sound within and externally really DOES have a powerful effect us. It goes much deeper than doing it simply for pleasure and entertainment. It has deep physical, emotional and spiritual significance which connects with our DNA and consciousness over all. I am not so much referring to listening to music or making music (although that in and of itself can have powerful emotional effects), I am referring to the ancient sounds of chanting or any sound you make with your own voice or ‘hear’ within. Sound has the power to move physical matter. So, why is it that for the most part we are not using sound to heal our body and mind from all kinds traumas? The ancients knew it, but we often ride it off as folk law and myth and something that people ‘used to do’. So, did I achieve my goals? Well, I can honestly say my right hip has more freedom in it. For most of the course as I meditated I was getting spasms throughout my lower back and hip, and they happened most when I went into my deepest state of relaxation and focus. I feel it was like the energetic kinks were being worked out of me. If this can happen over 42 days, I wonder what another 6 moths of practice of these sutras might do? My tinnitus has definitely lessened. I have enjoyed more connection with my yoga students when I teach my classes and have felt more relaxed about teaching them and like I can be myself more than I felt I could before. In terms of psychic abilities, well, I have been getting more intuitive hits as to when to take a certain action, and receiving a really calming message on the day I was going to have a medical procedure that I had been procrastinating on for around 8 months partly due to the expense of it, and partly being worried about what they would find and the uncomfortable nature of the procedure itself. On the morning of the procedure just after my meditation I got this strong sense almost like someone was speaking to me that everything was going to be OK. And it was. My worries were unfounded. The procedure went well, and at this point, no further action is required. I also feel that my thoughts and mind are just more ordered. I have an easier time knowing what to mentally say ‘no’ to and what to mentally say ‘yes’ to. For example, will I allow myself to spend ages watching a YouTube clip that only really instills fear in me, or will I pay more attention to what gives me more life force? It is easier to shut down social media and news that drains my energy. What do I feel I am still missing? I feel I have not yet had enough time experiencing ‘the gap’ as many meditation teachers explain. I have flashes of it where I feel pure bliss, but, I have not had sustainable bliss ‘gaps’. But, Deborah explains that it can take months of this practice to really feel you are getting into the gap most times you meditate, so as always, there are no quick routes to ‘enlightenment’. However, if a few months is all it really takes of consistent practice, in the bigger scheme of things, that is not long…. So I guess everything that I was hoping the course was going to help me with was helped. However, I can feel that this is still just the tip of the ice berg. I know that there are so many more benefits to come if I continue to practice this meditation each day. But the beauty of this course is now I have this mantra and sutra practice for life, and have learned how to do it. The course addressed many of the questions that came up as I was practicing and I am very glad that I am now part of Deborah’s Facebook group which you only have access to if you sign up for the course. This allows for discussion with others who are also taking the course which enhances your learning experience. I am really glad I documented each day of this course because there were things I definitely would have forgotten if I had not written them down. The benefits can often be subtle, so it is good to reflect on them as soon as you experience them. This also gives you more confidence in the practice and helps you commit more to the practice. My day by day experience each day with the course. So I have listened to the hour long meditation course that Deborah includes as a bonus in this course for week one where she gives us the first 5 sutras. I am so glad it was included because it refreshed my memory as to how to use a mantra while meditating. I must admit I found the sutras to be kind of weird and not what I expected (they don’t make logical sense to me). So far I am pleased with my purchase because for years I have been meditating with music or binaural beats thinking that will get me deeper into meditation. But Deborah explains in her course that using tools like that is really only going to get you relaxation. And while that is still a positive thing, what meditation is REALLY designed for is to get you into a deep gap of silence inwardly so you literally get lost and connected to a much larger consciousness than your day to day consciousness. Each time you visit ‘the gap’ profound healing takes place. She says it is quite normal to not reach the gap for a while, and while I did not get into the gap today, I did experience profound moments of deep stillness which I had not felt for a long time in meditation. Last night was a hot night and hence no one in my house got a good sleep. My 4r year old was up a few times and then at 6AM she claimed she just had to get up because she was hungry. So, there went my time for meditation before she got up, so once I got her to kindergarten, I went home and meditated straight away. Towards the end of the mediation is when I began to feel the most benefit, and I did notice quite a shift in stillness once I completed the sutras. But my mind was wondering everywhere today-I very much want to be doing this first thing in the morning before anyone else gets out of bed-but I am not always guaranteed that quiet time with a 4-year old… Anyway, at least I still got a mediation session in. I had to make two attempts to mediate this morning. The first attempt my 4 year old daughter got up 5 minutes into my meditation, so that was the end of that. We had breakfast and I said to her ‘Mum needs to mediate for 20 minutes so do you want to watch something on TV while I do this?” She agreed and I explained that I didn’t want to be disturbed so if the door to my office is closed, please don’t come in. She seemed to get it, but of course I was still interrupted once, but my partner by my partner was up out of bed and he dealt with it. But then, he himself disturbed me (even though I SAID I was going to meditate for 20 minutes) where he needed my help to solve the problem (Netflix had turned off and was steaming from my phone and he didn’t know the code to my phone. I mean-he could have sorted it out from his own phone but whatever… It occurred to me-I am really going to have to train my family NOT to disturb me and make this a time that no none comes in or tries to talk to me. I am only asking for 20 minutes. I will always aim to get meditation in before anyone else gets up, but so far 2 out of the 3 days I have tried this, it hasn’t worked out due to the unpredictable nature of when my daughter will wake up. So, I think I am going to make a sign for my door, and so when my family sees the sign is up, they know not bother me. It is the only way I am going to be successful with this meditation practice I feel. It has made me realise why I have not successfully committed to a daily morning practice in the past-too many variables! So, I don’t have a lot of sympathy for people living on their own without kids who say they have no time to meditate! Anyway, second attempt this morning was better, but I also put binaural beats on (kind of like white noisy to drown out what had become a noisy house now that everyone was up. I know that I am successfully meditating when I get spinal twitches and spasms in my lower back and hips. I have a lot of tension and an old injury in my lower back and right hip, so when these areas start to spasm in meditation I know something is unraveling. Deborah explains how these kinds of reactions are a good sign that you are letting go of long held stress. Well, this happened a lot this morning. My daughter once again got up at the same time as me, so once again I planted her in front of the TV so I could get 20 minutes of meditation in. I don’t like doing this, but so far it is the only way I can get the time in, other than getting up perhaps at 5.30AM on a weekend-which is not something I really want to do! But anyway, today I felt a spontaneous movement within my neck which was kind of like circles with my head. It was like the tight muscles in my neck and shoulders were unraveling themselves. I have not yet made ‘the gap’ but it is early days. This morning I stayed laying in bed to do my mediation because I felt that if I got up, my daughter would get up and then I would have to plant her in front of the TV again. This might be a good plan moving forward, only if my partner is not up and he suddenly wakes up in the middle of my meditation then that would be kind of annoying too. Successfully got a meditation session in before anyone in the house was awake. It really is the best time to do meditation, but just means I am committed to always getting up earlier than I would like. But maybe that is a good thing. Well that is the first week complete! It feels like it went quite fast. This morning my daughter is sleeping late which meant I got my meditation in. Last night I had very vivid dreams and they had themes of feeling trapped and unrequited love. Is this my psyche revealing things to me that are being released? It has been a while since I remember my dreams. The only other times I seem to remember intense dreams is when I am on a NES program. I have found that NES seems to open up parts of my mind and emotions that have either been buried or tends to give me an explosion of creativity. Perhaps a daily meditation practice is doing the same for me? I wonder what would happen if I combined both a NES program and a daily sutra practice… I am looking forward to ‘unlocking’ the next sutras and learning more in week 2. We have had internet problems over the last couple of days so I have not updated on my meditations but they did take place. I am now on week 2 of the course and this week is mostly about the benefits of mantra meditation. Debra goes into the science of it and how it is the most powerful form of meditation anyone can do. She says that because of all our modern distractions these days it is very hard to truly get benefits from other forms, but having a mantra to focus on makes everything extremely simple. I am continuing to have spasms in my lower back while meditating and I had an interesting experience this morning in that I went into meditation with pain in my lower back and right hip, and came out of meditation virtually pain free. It was interesting. I have struggled with my right hip and lower back for years-it is something that comes and goes but since I have been back teaching yoga, interestingly I have actually had MORE lower back and hip pain rather than less. Something is obviously been aggravated but I am not sure what. The new sutras are easier to remember and I do feel they take me deeper in my meditation at the end. I am beginning to think that I perhaps need to organise my day better to get these meditations in. Even though I have stuck to at least one meditation per day since beginning this course, I feel I could be maybe doing it at a better time-for example, 5 o’clock in the morning. Why? Because of the quietness of the morning and the stillness in the air. Apparently 3AM is actually the best time to meditate for spiritual growth and deep insight and healing. This is known as ‘lung time’ in Chinese medicine and represents taking in inspiring thoughts and a deeper cosmic connection (we inhale inspiration and exhale stagnation for example). This is commonly the time monks will meditate for example. Deborah suggests it is also the best time and what you can do (especially if you tend to wake up in the middle of the night at this time anyway) that you can mediate sitting up in bed, and then go back to sleep afterwards. It might be something I try as I have often noticed I do wake up at this time when I glance at the time. One thing I noticed last night since beginning this course is that my tinnitus is better. It is not so pervasive and does not bother me at night like it has in the past. Apparently tinnitus can be a sign that you are not listening to your inner voice (don’t worry I have had it checked by the medical profession…so I am not being blindly ignorant). This course makes me want to rethink all my habits and routines. For example, I think I’d be more grounded if I cut out coffee, if I exercise first thing in the morning every day rather than sporadically, plus commit to a qigong practice each day. How to fit all this in? Plus, I feel I am absorbing a lot of information via YouTube that perhaps does not serve me in anyway and only serves as a distraction to what I am really supposed to be doing with my life-my deeper calling. Anyway, today I practiced qigong before I meditated, but I had two coffees before practicing qigong, so although I still felt benefit from meditating, I know I’d likely get more benefit if I did not drink two coffees beforehand because my mind would be more quiet. Hmmmm, more 30 day challenges coming up I feel….30 day quit coffee challenge, 3o day exercise in the morning challenge, 30 day early to rise challenge and 30 day qigong challenge. The question is, how to combine all and not get overwhelmed? It would need to be something that is one seamless routine first thing in the morning rather than several challenges. It would need to be time blocked each day and stuck to….. Anyway, I once again got some pain relief in my hip and lower back after meditating today. Today I had a very brief moment of absolute inner stillness. It happened as I began the sutras at the end of the meditation. I am starting to get excited about where this practice might take me. Time will tell. This morning I was awake at 4AM so I decided I might as well meditate. It was definitely different in that I felt my energy was more settled and everything was quiet. But I felt I was half going in and out of a dream state even though I was sitting up, so I am not sure how effective it really was. I did notice a real relaxation in my abdominal area though and it was like gastric juices could flow and I felt a certain grounded energy. I found it difficult to go back to sleep however-and I am not sure if I actually did get back to sleep properly as the rest of the morning before getting up felt like I was just half dreaming and half sleeping. Two weeks in exactly. I got up earlier today to meditate-it feels like a better time than 4am in the morning. I just feel like I can experience it more rather than being in a dream state. But, I am more prone to fidgeting, but over all I think it is a great way to start the day. I also finished today’s meditation with feelings of appreciation towards certain people and situations in my life. I think focusing on the positive is something we all need to practice. I really enjoy the sutras. I feel a deep wave of relaxation come over me when I get to the sutras. I think I am getting more and more used to sitting for an extended time. Today nearly 30 minutes went by and I didn’t even really notice. At first, I felt impatient, peeked at the time and was only 10 minutes in. So then I just fully surrendered and before I knew it, it was nearly half an hour and I still had not got to the sutras. I don’t know where the time went. I still feel I am having a lot of thoughts and not really getting into the gap, but maybe I did today because I did not notice the time, I also got a strong direction as to one action I should take with my yoga classes for my students, and I will act on this because it feels right. Day 16 and into week 3. Psychic abilities, clairaudience, clairesentience,, mediumship, claircognizance, telekinesis, the gift of prophecy and the gift of wisdom. There may be other gifts that pop up such as perhaps suddenly being good at public speaking or some other gift that you may have been unaware of, so it doesn’t always have to be a gift of a highly esoteric nature. She says it all depends on what is going to serve you best. She says that everyone is different and not everyone will receive the same gift. She asks us to consider what gift we would like to develop in ourselves and I was most drawn to the gift of prophecy and the gift of being claircognizance. She says these gifts may start to pop up from now on in the course or weeks after so long as the practice of the sutras is ongoing everyday (I have not yet skipped a day) and for best results we should practice twice a day. I have not been practicing twice a day as meditating at around 5pm is rarely convenient for me, and she admits in modern life it is rarely convenient for anyone. But she says it needs to before dinner time otherwise the meditation will interfere with sleep. Well, I may just try it out before bed time and see what happens and see if that is true for me. I have not yet experienced the deep gap that she speaks of, but sometimes I feel I am close. I feel extremely tired after the seeding of this weeks sutras. I am getting glimpses of the gap, but I still feel my mind is very busy. What tends to happen is I get streams of inspiration for where I can take my career and actions I can take. My mind follows those thoughts and I start imagining myself doing those things and then I have lost my mantra and more in through than meditation. I am guessing that I should probably follow up on those inspirations, write them down and use them as my next logical steps. I must have a lot of traumas or stress in my pelvis as the jolts and spasms continue on all through my meditation. They occur when my mind is at its most still, and especially when I get onto the sutras. I do have history of low back injury (bulging disc at L5/S1) also have problems with hip alignment (hips are twisted and therefore right side is extra tight) and a history of endometriosis so that affects my entire pelvic area. I was able to sit for 35 minutes today without even really noticing it. Deborah doesn’t recommend sitting for more than 15-20 minutes, but today time just flew by for me. I don’t have a lot to report over the last 2 days-the meditations seemed uneventful and routine. I feel I am ready for the next part of the course and more sutras. I feel the most engaged in meditation when I get to the sutras. Today was really interesting. After I meditated with the mantra I felt this real kind of cooling sensation in my throat. I wondered if I had eaten something minty that I had forgotten about because it was that tangible, but I had not. It was a really pleasant opening kind of sensation and I wondered if it was a sign that perhaps my throat chakra had just opened. This week in the course it is all about initiation which in a nutshell is all about going into the next level of spiritual development. The core message in order to be ready for initiation is that you need to be prepared to be in service to others and keep your ego out of it. I found this weeks teachings really interesting as Deborah dived into the Melchizedek Order and I loved this as she spoke about the great experiment of humanity and how all the religions of the world are really just one thing-just different expressions. If you have delved into ancient history such as Atlantis and ancient Egypt you will feel akin to these ideas. I have recently explored this kind of history so I felt very ready to embrace what she was talking about. I was fidgety today-really need to be up earlier some days to do this meditation more peacefully because I am half listening out for my daughter to get up, and that is a distraction. But being up earlier means going to bed earlier which also means, less social media/screen time at night. That can only be a good thing right? But sometimes it is truly how I like to disappear and unwind at night-so much interesting stuff to watch on YouTube! Anyway, today I struggled to remember the 7 new sutras that we were given for week four. They are more complicated than all the other sutras, but they have certain rhythm to it, so shouldn’t take long to remember. But I had to take sneak peaks at each of the new sutras as I was meditating today, so I don’t know if that means they were still effective or not. OK, it has really been indicated to me today that I need to stop drinking coffee before my meditation in the morning. I thought for a while it was helping me focus, but today I felt quite strongly that I need to be less buzzed up. I began a new qigong training program yesterday, and it is very deep training compared to what I have done in the past and has already made me keenly aware of of energetic sensations in my body and pain points I was kind of suppressing both emotionally and physically. So, today when I went into meditation I was more aware that my solar plexus area is super tight and I was struggling to breathe freely and sink down into my body. I felt that the caffeine buzzing around my body was the main reason I was having difficulty being more in my body. So, tomorrow I will not start the morning with coffee before my meditation-just warm water with a squeeze of lemon! Actually, one of my goals as a result of these ancient practices I am delving into at the moment is to quit coffee-or at least release its addictive grip on me. I am very much addicted! In order to do this successfully, I know I am going to need to allow more energy to enter my body and the best way to do this is through meditation and qigong. But I need to practice every day. So, on top of this 42 day meditation challenge, I have also just begun a 100 day qigong practice challenge. The last few days have been less than ideal just in terms of not getting up earlier enough to get a decent peaceful meditation in. I say this because if I leave it too late to get up, I always have in the back of my mind that my daughter is about to wake up and my meditation will be cut short-which is what happened yesterday, so I vowed to get up earlier today, and I did. I have tried without coffee first thing in the morning, and while this makes a small difference, I think the most important thing to feeling as if the meditation was successful is to give yourself proper time and space to do it; and also, don’t scroll through any news feeds or social media feeds before you meditate (because this is already over loading the brain) or check emails or whatever. I feel this is where I have gone wrong sometimes and it just takes me away from myself and makes my brain busy. So this morning (day 26) I did qigong before I meditated for 20 minutes, and I feel this was really good. And during the mediation, I also focused on feeling energy in my body-the sensations in my body, the pain points and how the energy might be moving around these areas. I found this really grounding and I was able to focus on the mantra much more and let go of busy thoughts. I think opening up the body and energy pathways before meditation is really effective, and I suppose that is why traditionally yogis and other ancient energy arts practitioners have started with physical movement before their meditation. I don’t think it is essential to get a good meditation session in, but for me, I feel it works really well if you have the time. So, I think from tomorrow onward my rising time will be no later than 6am. One of the biggest challenges I have had in committing to this practice is to actually carve out the time and take it seriously. I haven’t skipped a day yet, but I think the attitude towards sitting and meditating is just as important as actually doing the meditation-it can’t be seen as another thing to tick off your list of things to do-because then I think the point of it could be missed. I am still feeling resistance to going to bed earlier so I an get up earlier to meditate in a way that I can really feel no one is going to disturb me. No wonder the monks meditate at 3AM LOL! I really don’t know at this point if I am making progress, but I will say that generally speaking I am feeling more calm and centered. I once again did qigong before meditating this morning and I can definitely say it makes a good deal of difference to enliven the body like this before going into a mantra meditation. I just feel I can focus more, and engage more with the sutras. Today I think slipped into the gap. It felt like bliss, happiness, deep peace. It was only for a moment. I also saw quite a bit of purple light behind my eyes during my meditation. I feel more at ease with the 18 sutras we have been given in the course so far. I forgot to mention the other day that one of the reasons I feel more centered these days is because when I teach my Body Balance class, I feel I deliver the class with less effort. I feel I can flow with the class and feel more comfortable as I teach and connect with people a little better. I feel less anxious right before I teach and walk in and set up in a way that I feel more at home. In the 5 years I have been teaching, I don’t think I have ever felt so comfortable. I am still unsure if I have initiated or not yet. I am guessing that I have not, although today felt like a different meditation, and I didn’t even do qigong beforehand, and I still drank my one cup of coffee. I felt a deepening physical relaxation this morning and a deeper connection once more to all the sutras and feel that the 18 sutras we have learned so far are now committed to my memory. This week took a little longer to embrace the sutras due to receiving an extra 7 and they were longer. But, I feel I have integrated them now. I think I will uninstall YouTube on my phone, and perhaps maybe Facebook. I am up too late at night looking at these things in bed, and I know they are not productive or life affirming habits to have right before bed! better to listen to an audio book or guided meditation I think. I think I initiated yesterday. I was beginning to think that I was not going to, but Deborah said that one way initiation can happen is a sudden urge to cry uncontrollably. Well, this happened to me yesterday, with no warning, completely out of the blue, with no logical reason attached to it. I just suddenly felt a deep sadness for the world and questioned why there was so much pain in the world. I had been listening to some 432hz meditation music, and perhaps the sounds brought it out of me, I am not sure. I had been practicing qigong right before, and then as I finished I read some comments from the YouTube channel where I was playing the music and there was so much appreciation towards the person who had uploaded the music. I had begun to feel emotional before reading the comments, but I read one comment where a woman described so many challenges in her life-and that triggered me so much that I suddenly felt the urge to really cry. I just felt a deep longing to know why people have to go through so much struggle on planet earth. I imagined what it would feel like to have the challenges that the woman was describing and I knew that would just break me! And yet, she somehow struggles on and writes how much she appreciated the music. I also felt so blessed in my life too as I have nothing like the kinds of struggles she was talking about….. We are so fragile, and yet somehow so resilient at the same time. So perhaps this was initiation-I don’t know. Nothing dramatic to report today. A few times where I was seeing purple/violet behind my eyes when I was at my most still inwardly. Day 33, 34 and 35. On day 33 I managed to get up at 5.15am and I had the best meditation. Really early in the morning truly is the best time to meditate. Not only is it physically quiet, but there is an energetic stillness present that is not present at around 7am. On day 34, I was feeling unwell and I was unable to stay up at 5.15 to meditate, so I actually went back to bed, and meditated later in the day. It was not as good as it was the previous day. Today, I slept past my alarm and missed the 5.15am window-I am physically not 100% well still, so perhaps I needed the extra sleep. To be honest, I am starting to feel skeptical about this practice. As I go through the course and all its Hindu teachings, I just feel there are so many rules-too many rules, and I feel myself questioning and inwardly rebelling. What is enlightenment anyway? Is it simply experiencing a deep peace within? If so, I feel there must be more simple ways to go about it. Not that this meditation practice is not simple, it is just that all the associated teachings with it seem overly complex, and I am suspecting that simply practicing wisdom healing qigong would feel more rewarding to me and a better use of my early morning time. Mantra meditation leaves out the body. I think the body should be included and an awareness of the energy flow or life force throughout. We are on a physical plane after all. However, I did have an interesting experience the other day in that I got confirmation that a higher kind of guidance has kicked in. On day 33, I had to go in for a medical procedure to get something checked out. I have been secretly worried about this procedure for months, for fear of what they might find and the procedure itself is not pleasant at all. Anyway, on the morning of this procedure (the morning I was up at 5.15), I got clear guidance that everything will be OK. This was repeated to me a few times that day, and afterwards when I came home and was in pain. Everything WAS OK. They found nothing to be worried about, and now the whole thing is done and I can move past. But the point is, I have never received clear guidance like this. It did give me some courage, and I did feel that something was looking out for me-an energy form, a guide, a spirit? An angel? I don’t know, but whatever it was, it was comforting. So, perhaps I am making progress. I am glad I am documenting as I go, because I would simply forget a lot of the experiences I have had and take them for granted. Up at 5.15Am again and once again I really like the stillness of the morning. It does make it feel easier to meditate. I have all 20 sutras now and feeling comfortable remembering them all in their sequential order. I feel the most still when I am doing the sutras as my mind has continuous moving things to focus on, as opposed to one mantra, which I often feel my mind is going all over the place and switching into day dream mode. I will admit, I am now looking forward to finishing the course. I have not skipped a day of meditation, but I feel I want to change up my morning routine to include a moving mediation instead. What doing this practice has taught me so far is discipline to commit to a morning practice. To value my time. My thoughts feel more ordered, and I feel like I have streamlined my life more. I have become more conscious about how I am using my time and the things I want to be focusing on. Time is so precious. You can’t get it back once it has gone. I also feel more relaxed generally speaking and have better ability to focus on the goals I most want to achieve. Today I felt restless in my mediation and just wanted it over and done with. I know this is probably a moment to pay attention to as I might be about to experience a breakthrough, so This post will show up again tomorrow and see what happens. I am tempted to quit today and use my mornings in another way (for example, fully commit to qigong only), but I will stay the course and honour my commitment to these 42 days. I once again felt restless and just wanted to get the meditation over and done with. Even the ticking of the clock was annoying me and I generally felt impatient. Just as I was about to give up on the meditation because I was beginning to feel I was getting nothing out of it, I changed the room I was meditating in. This made a huge difference and I felt I could really be in the meditation a lot more. I had been meditating in my office where I work from home, and I think that perhaps the busy chaotic energy where I work was beginning to affect my meditation. So, I feel it is important to choose a place to meditate that is not an area where you might use a lot of mental energy. Today I once again had that experience where my throat felt a cetain coolness after meditation. It is like a minty sensation except without having actually eaten a mint and is only felt in the throat and not the mouth. I am intrigued by this and once again wonder if this is my throat chakra opening up. The sensation stayed with me for at least 2 hours. I must admit, I am feeling as if it is easier to connect to my yoga class partipants since taking this course-I feel more at ease expressing myself and standing on stage before the class begins and just randomly talking about things before I begin teaching. I am very pleased I took this course and like how my mind seems more calm and I can make better decisions about things and I feel more ordered when it comes to how I run my life. It has definitely given me new perspectives of life and spirituality and helping me connect some dots to ancient history when it comes to humanities purpose for being here and where our true roots may lay. However, now that I have completed this course, I want to delve even more into qigong and replace my morning meditation with a qigong routine. My reason for wanting to experiment with this is because one thing I feel about meditation is that most of the time it does not really involve the body, it is all about The Mind. I think I might be able to get faster results by diligently practicing qigong and embracing the Tao. I found Be A Modern Master really enriching, but it has also strengthened my resolve to become a qigong master. It is almost as if I needed to take this course to help me commit even more to qigong. Qigong embraces all the principles of energy, sound, meditation with the added benefit of body movement. My final rating: 9/10. As with all Mindvalley programs ( I have taken a few now) I love the high quality of teaching and delivery. I love their technology and their app which seamlessly delivers their courses and makes it very consumable. The only thing I could say that was negative about this course is that there was a section where Deborah talked quite a bit about reiki. She talked about how we could get reiki symbols removed. At this point I honestly had no idea what she was talking about and was a little annoyed that she spoke of this as if we all knew everything about reiki. I don’t know much about reiki other than I know it is a form of energy healing and I don’t know how it relates to the sutras. So, when she took us on a meditation to get these so called symbols removed, I kind of felt lost and suddenly disconnected to what she was teaching. But it wasn’t a huge part of the course-just a small section and I guess given that she is a reiki practitioner herself it makes sense that she would want to share something about it. What I really like about her teaching method is she says it is really important that we don’t take what she says as gospel and that we use our own discernment whether something resonates with us or not. We should only take what is useful to us, and to me I felt the fact that she said this allowed me to have more confidence in her because she is not asking us to blindly follow what she says and not think for ourselves. She wants us to know our own mind. This is very in line with Gnostic teachings, and I like that. If you would like to purchase this course, click here. If you would like to check out the free masterclass, click here.